One hundred and twenty years ago today, March 24th, 2010, Agnes was welcomed into her family, and through time she changed the world around her and beyond. "It is no exaggeration to say that we are surrounded every day with the tangible gifts of the life's work of Agnes Macphail. Not that she alone created these things but she provided one of the clearest, strongest voices for the major thrusts of social reform and development in Canada. She did not live to see many of those directions fully realized . 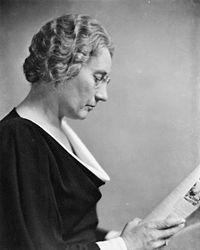 . . "
This website has been designed in honour of Agnes Macphail's 120th birthday. It is the story of a group of people who accepted the challenge to remind all ages in the local community and the world beyond, of Agnes - the first woman elected to Canadian Parliament. And, as important to see her in light of her home community life, friends and family. (South-East-Grey, South Western Ontario, Canada).